I love tea. Decaf Earl Grey with lactose free milk is my favourite. 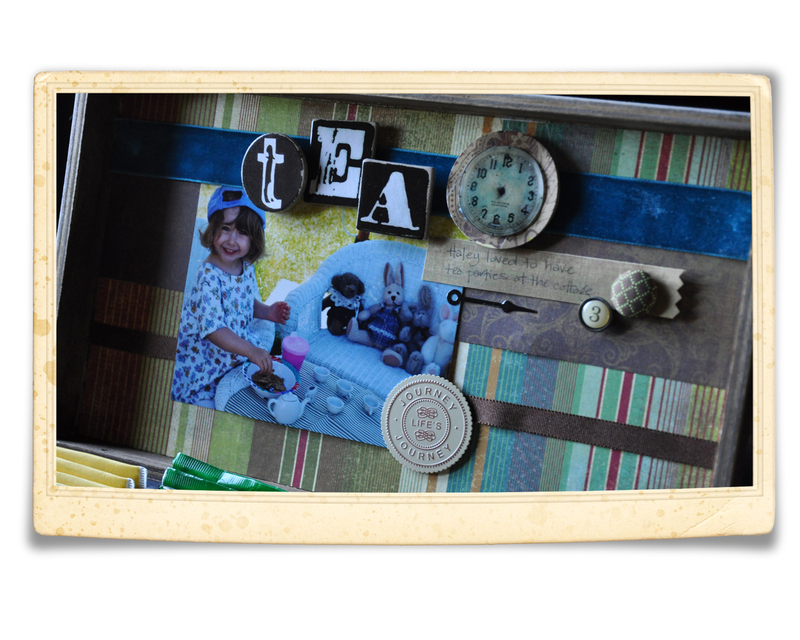 This is a tea box that I decorated at the cottage a few years ago. It was just a plain wooden tea box and I'm not really sure where I got it from. It was not an antique or I'd remember everything about it. 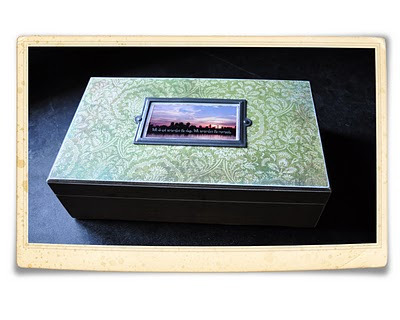 I used my scrapbooking papers and some embellishments to decorate the outside and inside of the box. This is the outside of the box. I used modge podge to glue all of the scrapbook papers to the box. If I was making it again today I would have used gel medium instead of modge podge but either will work. I sanded the edges of the paper to give the box an aged look but also to make the corners tidy. I didn't do a lot of decorating on the outside lid of the box because the box is usually open when I use it for company and when it is not in use it's in the cupboard. The picture in the metal frame is the sunset in front of our cottage ... my favourite place and time to sit and drink my tea. 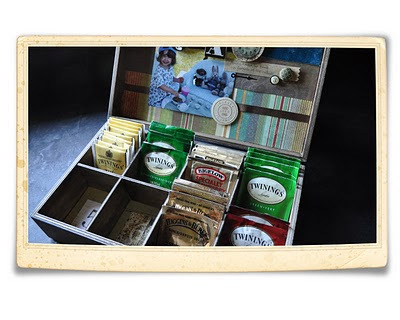 Here is the inside of the box ... you can see that I stained the wood ... it would have taken too long to add scrapbook papers to each of the dividers and I figured that they would be covered with the tea bags most of the time so it was not really worth the time or paper. I found scrapbook papers with numbers on them that fit perfectly in each little section (I love numbers). This is my favourite part of the box and the reason I wanted to decorate it. I used a picture of my oldest daughter when she was 3 years old to decorate the lid. She loved to play tea with her stuffed animals ... she had a play house at our old cottage and she would pull all of the wicker furniture out of the play house and set up a tea party under our umbrella. I loved those days. 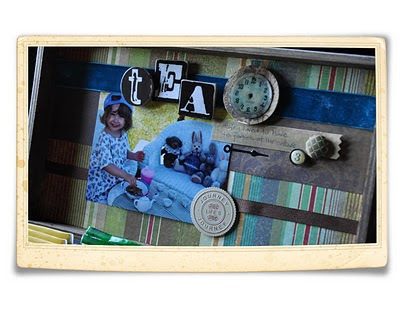 I had to be very careful when I chose elements to attach to this layout because I didn't want them to fall off or get hit by the tea bags. 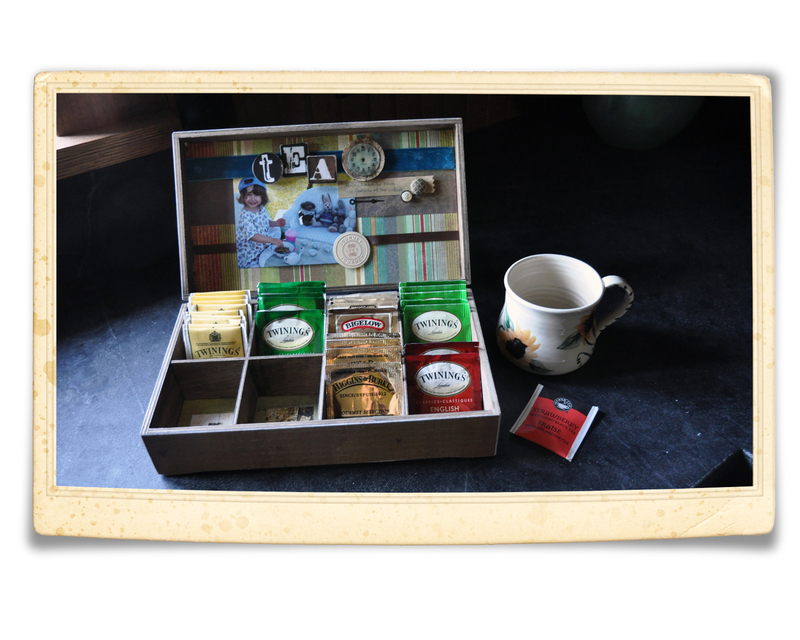 I've been using this tea box at the cottage for about 5 years. I really should look for another tea box so I can make one for home. I'd love to find a picture of myself and my grandmother drinking tea together when I was smaller ... that would be a great keepsake. I hope that if you have one of these boxes hanging around in your home that you will think about personalizing it with something that makes your heart sing. I'm teaching this weekend at Scrapbook Queens in Mississauga and I am hoping that some of the new scrapbook papers for Fall and Holiday have arrived! I'm starting to think about Christmas gifts already. Have a great week! !